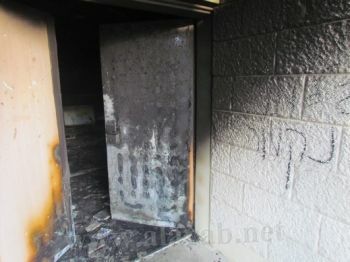 By torching the mosque in the Arab Village of Tuba-Zangariyeh in the North on the night of Oct. 2, the racists of the extreme right expressed their hatred for Israel’s Arab citizens. In everyday reality, the village of Tuba-Zangariyeh suffers from severe discrimination in infrastructure and employment at the hands of Israel’s various governments. Thousands are employed in factories and farms in the region as manpower contractor laborers, without peripheral benefits. The Tzahar Industrial Park, located next to the town, pays land taxes to nearby Jewish towns (Safed, Hazor and Rosh Pina) but Tuba-Zangariyeh doesn’t receive any of the revenues. It’s not the rightwing phalanxes who harm the town’s residents – it’s the policies of Israel’s governments that make life hell for them. The Village is home to hardworking people, laboring via manpower contractors in the Pri Hagalil factory, as truckers in haulage firms, and in agriculture. Most of the town’s residents suffer from poverty and injurious employment terms. The “price tag” act in Tuba-Zangariyeh is a racist act of the extreme right which enjoys the support of the rightwing, racist government of Benjamin Netanyahu, Avigdor Lieberman and Ehud Barak. Those who incited ceaselessly against the Arab population are today reaping the harvest of their words in the form of vindictive violence against hardworking residents just for being Arabs. We at the Workers Advice Center counter this racism with solidarity and equality. We call on those who demonstrated for social justice to stand by us now in support of the residents of Tuba-Zangariyeh, to demand the perpetrators of the mosque arson be brought to justice, and to insist on fundamental change to the discriminatory policies against the Arab population of Israel. This government inciting racism against Arab citizens is the same government taking advantage of racism and implementing “divide and rule” tactics to better serve the tycoons and rob ordinary citizens, both Jews and Arabs, of the right to welfare and social justice – this robbing, at least, is egalitarian. No social justice can take root in the shadow of racism. The struggle for social justice and the struggle against racism must be aimed at the same target: the government. And the response to both exploitation and racism must be the organization of workers, both Jews and Arabs together.